Just finished this yesterday. Obviously I ran out of purple on the last row of scarf, but I like it anyway. If anyone wants the pattern I will publish it and eventually get it on my Ravelry, where all my patterns are free. 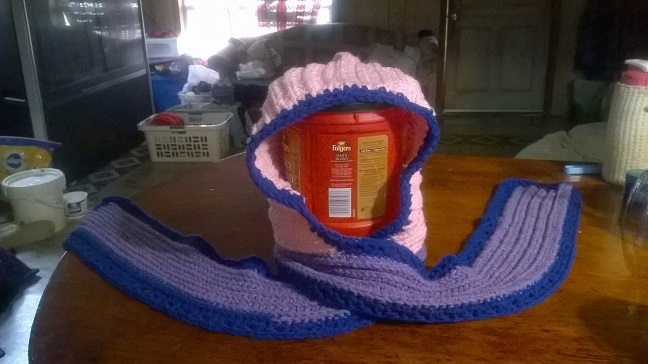 It's pretty simple, up until the scarf construction, but even that isn't too difficult. I just used stash yarn to do it with. The pink came from an old afghan I pulled apart and it had some stains in it. But some oxy powder took care of that. A turn in the washing machine/dryer, and it looks great.